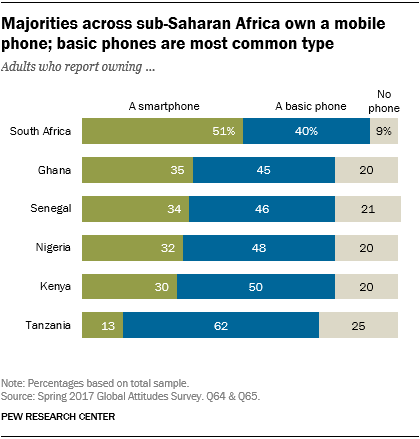 Large majorities in all six sub-Saharan countries surveyed own mobile phones. Ownership is highest in South Africa, where about nine-in-ten adults own a mobile device, and lowest in Tanzania, where three-quarters own a phone. Basic phones – such as flip phones or feature phones – are generally the most common type of mobile device owned by sub-Saharan Africans. The exception is in South Africa, where 51% own a smartphone that can access the internet and apps, making it the most common device in that country. 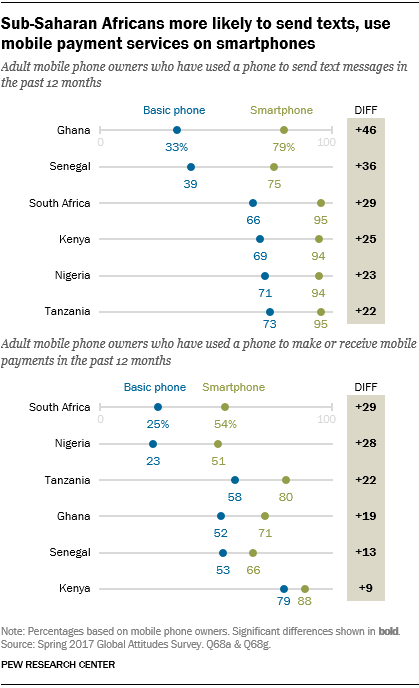 In Ghana, Senegal, Nigeria and Kenya, just about one-third of adults own smartphones. Smartphone ownership is again lowest in Tanzania (13%). For comparison, 77% of Americans reported owning a smartphone in January 2018. Worldwide, sub-Saharan Africa has the lowest rate of smartphone ownership of any geographic region. 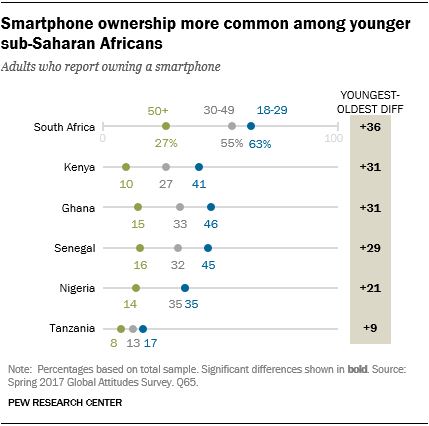 But smartphone ownership is increasing across much of the developing world, including in sub-Saharan Africa. For example, 34% of Senegalese adults now report owning a smartphone, up from just 13% in 2013, the first year the question was asked. 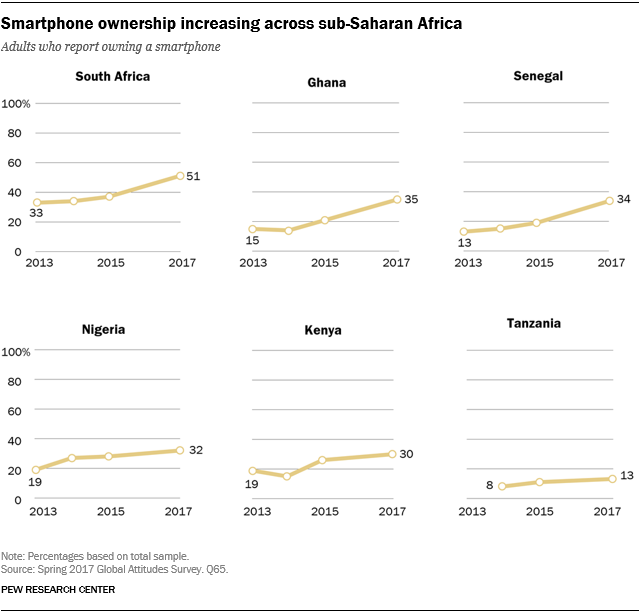 From 2013 to 2017, smartphone ownership also increased significantly in Ghana, South Africa, Nigeria and Kenya. Smartphone ownership has remained relatively stable – and low – in Tanzania since 2014, when the question was first posed there. 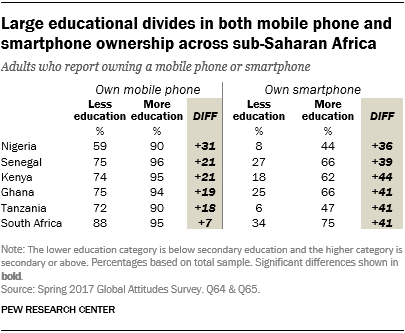 Even as mobile phones and smartphones have become more ubiquitous across much of sub-Saharan Africa, important educational, financial and generational divides in ownership remain. Gender gaps also persist in some countries. In all six sub-Saharan African countries surveyed, people with more education are more likely to own any type of mobile phone, including smartphones.1 For example, in Kenya, 95% of more-educated people – meaning those with a secondary education or more – own mobile phones, compared with 74% of people with less than a secondary education. Even larger educational gaps appear for smartphone ownership in all countries. Looking again at Kenya, 62% of more-educated Kenyans own smartphones, compared with just 18% of those with less education. 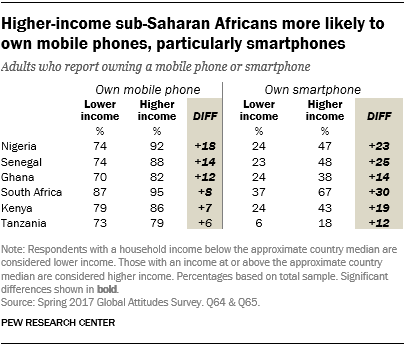 Similarly, wealthier people in most countries are more likely to own mobile phones of all types – but the gap is particularly large when it comes to smartphone ownership.2 People with higher incomes are much more likely than those with lower incomes to own smartphones. The gap between richer and poorer is highest in South Africa, where 67% of higher-income people own a smartphone, compared with just 37% of lower-income people. In four of the six countries, adults ages 50 and older are just as likely to own mobile phones as adults younger than 30. The two exceptions are Ghana and South Africa, where older people (71% and 85%, respectively) are less likely than younger people (83% and 93%) to own mobile phones. But while mobile phone ownership is generally distributed evenly across age groups, the same is not true of smartphone ownership. In all six countries, people ages 18 to 29 are more likely to own smartphones than people ages 50 and older. These differences are often quite substantial; for example, in Kenya, about four-in-ten of those under 30 (41%) have these internet-enabled devices, compared with just 10% of people ages 50 and older. In four of the six sub-Saharan African countries surveyed – Ghana, Nigeria, Senegal and Tanzania – men are at least 11 percentage points more likely to own a mobile device. Similar gender divides in smartphone ownership exist in Ghana, Kenya, Nigeria and Tanzania, with men again being more likely to own smart devices. Among countries with significant gender differences, the gaps in smartphone ownership range from 6 points in Tanzania to 15 points in Ghana. For more on these demographic differences in mobile phone and smartphone ownership, see the detailed tables in Appendix A. Among mobile phone owners – both basic and smartphone – social and entertainment activities are much more common than other uses of mobile phones, such as looking up information. Text messaging stands out as one of the most common mobile activities. In every country surveyed, more than half of mobile phone owners report using their phone to send text messages during the past year. But popularity of texting still varies widely, from 82% of mobile phone owners in South Africa who text to 53% in Ghana. Taking photos and videos is also popular: In five of the six countries, half or more mobile phone owners say they have taken pictures over the past year. In Tanzania, however, only 41% of mobile phone owners say they take photos or videos. The most popular commerce- or career-related activity among mobile phone owners is mobile payments. In four of the six countries, at least half of mobile phone owners say they have used their phone to send or receive money over the past year. This activity is particularly common among Kenyan mobile owners: 83% report making or receiving mobile payments on their phone. Across the region, far fewer people use their phones to look for or apply for jobs (median of 18% of mobile phone users). 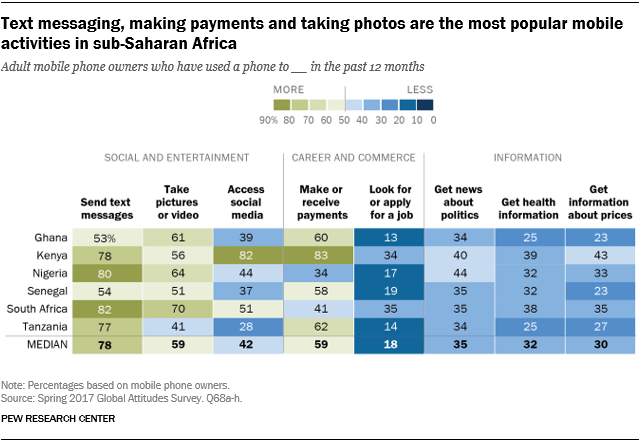 Most sub-Saharan African mobile owners are not using their phones to look up news and information. Only about one-third say they use their phone to look up information about politics (35%), health and medicine (32%) or consumer goods and prices (30%). Men are significantly more likely than women to engage in two of these three information-seeking behaviors: getting news and information about politics and looking up consumer information. But men and women are equally likely to engage in all other activities, with some variation within countries. Differences are much starker when it comes to socioeconomics and age. Younger, higher income and more educated mobile phone owners tend to engage more in almost all activities on their phones. Some of these gaps may be attributable to the different types of mobile devices they own. Many activities, like accessing social media websites, are more readily done via smartphone than basic phone. However, other activities can be accomplished via even the most basic of phones. But smartphone owners tend to engage in even these simple activities more than basic phone owners. For example, text messaging is easily accomplished on both basic and smart devices. In South Africa, while nearly all smartphone owners (95%) say they have used their phone to send text messages, only 66% of basic phone owners say the same. South Africa’s smartphone owners (54%) are also more likely than basic phone owners (25%) to make or receive payments via mobile phone, which is another activity that is readily done on any type of device. Kenya stands out as a country where even a large majority of basic phone owners (79%) report using their device to send or receive money, along with 88% of smartphone owners. These similarly high rates of mobile money-transferring could be due to the massive popularity of the M-Pesa service in Kenya. This service allows mobile users – whether on a basic phone or smartphone – to use text messages to pay for goods and services or to receive money from other users. As of 2017, M-Pesa had about 20 million registered users in Kenya, and its transactions amounted to almost half of the country’s gross domestic product.